After dreaming for nearly a year, last December 2016, I finally went to Taiwan. 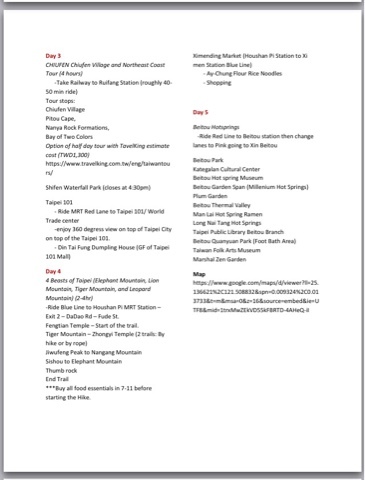 I was supposed to have the City Tour in the morning but I decided to have the afternoon tour in the itinerary prepared by Ms. Nicol Afundar. From TamSui Line. I took the MRT Red Line to Tamsui Fisherman’s Wharf Boat. Arriving at the wharf, I transferred to the opposite side via the round trip boat transfer. I explored the other side of the spot using the bike that I rented. Then, I went back to Taipei for my City Tour. Second Stop: Traditional Taiwanese Temple. This is one of the best spots to visit in Taipei. The structures are simply fascinating! A place to explore, wander and get lost! From Taipei, Keelung City, I took the high speed rail (bullet train) to Kaohsiung, Gushan District. The price of the fare is more or less PhP5,000. It took me 1 hour and 36 minutes to reach the city. Fastest speed was 330 km/hr. Upon arrival in Kaoshiung main station, Formosa Boulevard, switch MRT lanes from Red to Orange. Alight at Yangchengpu Station (Orange Line) and proceeed to Shoushan National Park. 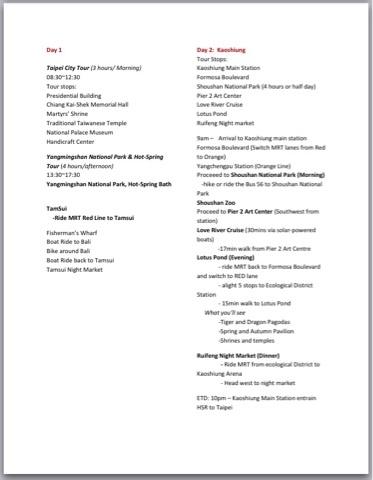 Hike or ride the Bus 56 to Shoushan National Park Shoushan Zoo. After the zoo, I proceeded to Pier 2 Art Center (Southwest from station) and tried to have the Love River Cruise (30 mins via solar-powered boats). Unfortunately, the tour was available only at night. Later, I proceeded to the Lotus Pond. I took the MRT ride back to Formosa Boulevard and switch to RED lane. Then, alighted 5 stops to Ecological District Station. From that stop, I took a 20-minute walk to Lotus Pond. Last stop for the day was the Ruifeng Night Market. Ride MRT from ecological District to Kaoshiung Arena. Head west to night market. Unfortunately, there are days when the night market was open and it was closed during that day. Take Railway to Ruifang Station (roughly 40-50 min ride). After my 4 hour tour, I went back to Taipei and proceeded to Maokong Gondola. Last stop of the day, the most famous attraction in Taiwan - Taipei 101. During my stay in Taiwan, I made it a point to visit the famous night markets in Taiwan, namely: Shilin Night Market, Raohe Market, and Ximending Market. My personal favorite is Raohe for its various street foods. 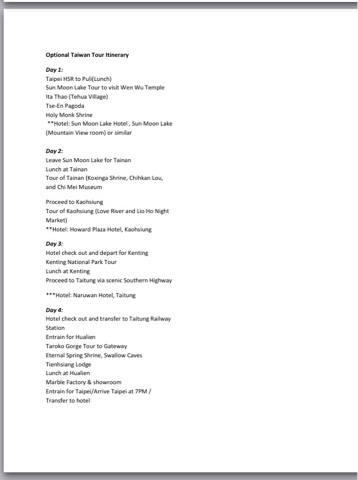 I did not finish all the spots in my itinerary. Instead, I went back to some my favorite spots. My reason - I intend to go back to Taiwan and continue my journey at a later date. I will surely miss the street foods in Taipei. Again, special thanks to Ms. Nicol Afundar!